Stocks found firmer footing in March, scoring sharply higher gains in the major market indices, as the Dow Jones Industrial Average jumped 7 percent, while the Standard & Poor's 500 Index rose 6.6 percent and the NASDAQ Composite added nearly 7 percent. The month began on a strong note as stocks built on their advances from the second-half of February, propelled by an upbeat manufacturing report and an encouraging jobs number that eased concerns that the U.S. economy might be slipping toward recession. Stocks continued their ascent, reacting positively to higher oil prices, news of monetary easing in Europe and fresh stimulus moves in China. The European Central Bank cut its refinancing rate to 0 percent, lowered its deposit rate to -0.4 percent and expanded its bond-buying program. The upward momentum continued as stocks posted additional gains, which proved sufficient enough to push the Dow and the S&P 500 index into positive territory for 2016 (though they remain below the highs of last summer). Stocks were buoyed by the continued rise in oil prices and the Fed's announcement that it was not raising rates and would be slowing the pace of interest rate increases in 2016 from what it had earlier anticipated. The markets retreated during a holiday-shortened week on lower volatility, sending the S&P 500 back into the red for the year, while the Dow barely hung onto its year-to-date gain. Seizing on dovish comments made by Janet Yellen to the Economic Club of New York, markets resumed their March climb with gusto, capping a solid performance for the month and providing welcome relief to investors. All sectors of the S&P 500 posted positive results for the month. Especially strong advances were seen in Energy (+9.44 percent), Technology (+8.49 percent) and Materials (+8.11 percent). Healthy gains were also realized by Industrials (+6.68 percent), Utilities (+6.54 percent), Financials (+6.92 percent), Consumer Staples (+4.75 percent), Consumer Discretionary (+6.38 percent) and Health Care (+2.66 percent). 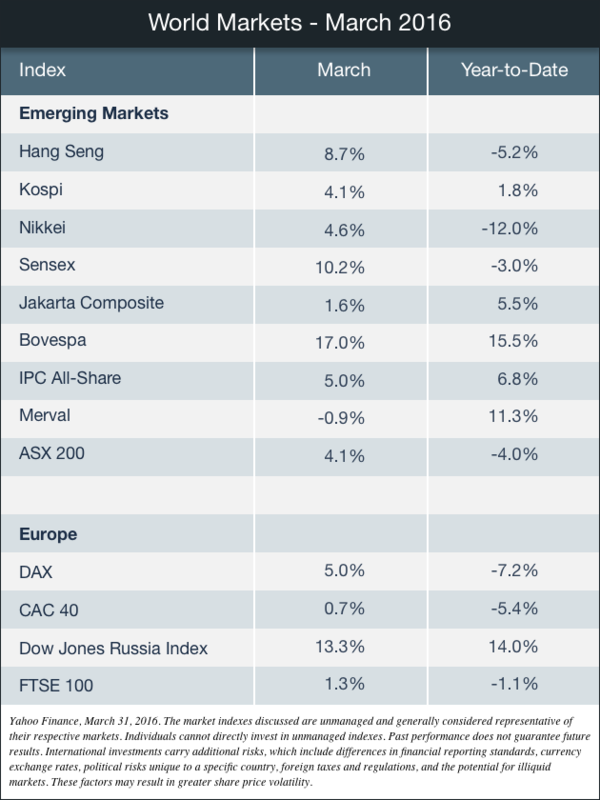 Markets overseas also enjoyed a strong month of performance with the MSCI-EAFE Index gaining 6.58 percent. Despite the overhang of weak economic signals and another terrorist attack, Europe moved higher, powered by Germany, Belgium and the Netherlands. Solid, though less impressive results were seen in the United Kingdom, France and Switzerland. Pacific region markets turned in solid performances, led by Singapore and Australia. Also posting strong returns were Hong Kong and Japan. Gross Domestic Product: An upward revision of the fourth quarter's GDP number, from 1.0 percent to 1.4 percent, reflected a slightly healthier economy, though declining corporate profits and low business investment indicated that the path of economic growth in 2016 remains uncertain. Employment: Job growth resumed, as employers added 242,000 jobs in February. The unemployment rate remained at 4.9 percent even as more Americans entered the labor force and drove the labor participation rate to its highest level in a year. However, wage growth disappointed, falling 0.1 percent. Retail Sales: Lower auto and gasoline sales led to a 0.1 percent decline in retail sales in February, while the retail sales increase reported for January was revised to a drop of 0.4 percent, casting a pall over what initially seemed like an encouraging start to the year. Industrial Production: Industrial production fell 0.5 percent, reversing some of the revised 0.8 percent gain in January. Capacity utilization, a measure of industrial slack, slipped 0.4 percentage points to 76.7 percent, below the 80 percent average from 1972 to 2015. Housing: Powered by construction of single-family homes, housing starts jumped 5.2 percent from the prior month. Meanwhile, existing home sales slid 7.1 percent in February as rising prices, low inventory, bad weather and a shaky stock market cooled demand. Owing in part to the declining inventory of existing homes, sales of newly built homes increased 2.0 percent. While sales have been uneven (for the first two months of 2016, sales were lower by 4 percent), this month's rise was another sign that the U.S. economy remains in an expansion mode. CPI: Consumer prices slid 0.2 percent due entirely to falling energy prices. This month's decline masked emerging inflationary pressures as the core prices (excludes energy and food) rose 0.3 percent for the month and 2.3 percent for the last year, recording the largest 12-month gain since May 2012. Durable Goods Orders: After a January rise of 4.2 percent (revised downward from 4.7 percent) in durable goods orders led to some optimism that manufacturing was emerging from its extended sluggishness, the most recent report suggested that any optimism may have been premature as durable goods orders in February declined 2.8 percent. The decline is the third time in the past four months that durable goods orders have shrunk, indicating that low oil prices, weak global economic growth and a robust U.S. dollar continue to weigh on the industry. Citing that caution was appropriate, the Fed announced that it was leaving rates unchanged and that any subsequent move to raise rates would depend on prevailing economic conditions and the outlook for economic growth. The central bank also lowered its expectations for the federal funds rate to 1.875 percent by the end of 2017 and 3 percent by the close of 2018. Investors may not be able to do anything about the forces that move the financial markets, but they can manage the taxes they pay on their investments. With the income tax filing deadline looming, investors are in a great position to assess the impact taxes have on their investments. 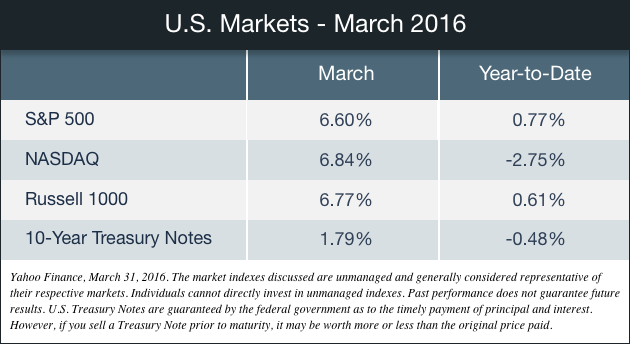 Now may be the best time to ask a simple question, "Do I have a tax-efficient portfolio?" Pairing investment sales with realized gains with sales of investments that have declined in value. Keep in mind these are general ideas to potentially increase the tax efficiency of your portfolio. Please consult a professional with tax expertise regarding your individual situation. 16. Distributions from 401(k) plans and most other employer-sponsored retirement plans are taxed as ordinary income and, if taken before age 59½, may be subject to a 10% federal income tax penalty. Generally, once you reach age 70½, you must begin taking required minimum distributions. 17. Keep in mind that the return and principal value of stock prices will fluctuate as market conditions change. And shares, when sold, may be worth more or less than their original cost.